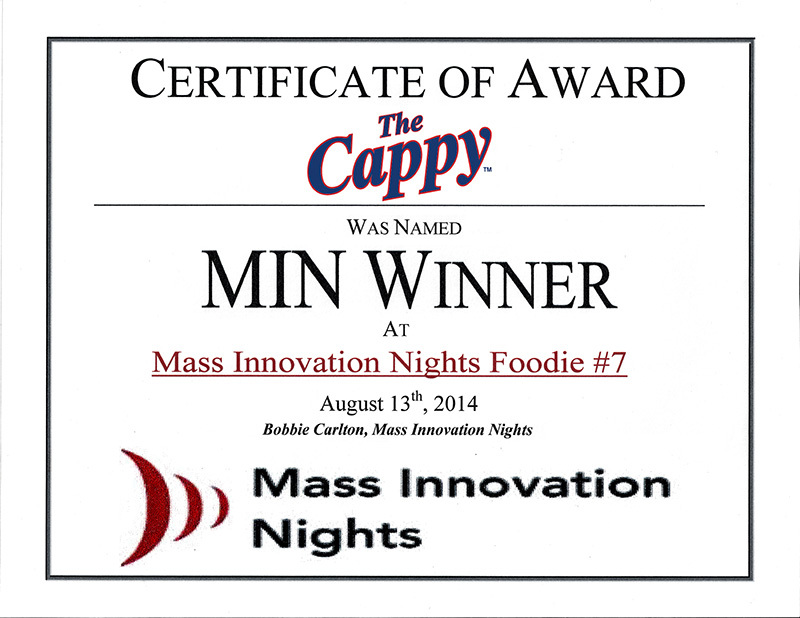 The Cappy was named MIN Winner! Mass Innovation Nights – A monthly event designed to for innovators to increase the buzz around new products and companies. Every month ten companies bring new products to an event and the social media community turns out to blog, tweet, post pictures and video, add product mentions to LinkedIn and Facebook statuses, and otherwise help spread the word. Held once a month (usually the second Wednesday of the month), MIN holds live events which allows companies to show off Massachusetts-based innovation. The Experts Corner team has one-on-one conversations with start-ups and entrepreneurs. Someone is crowed the winner and this month it was The Cappy. MIS calls Innovation Night a “stone soup” event. Remember the folk story of Stone Soup? A stranger or small group of travelers come upon a poor village. The travelers are hungry but everyone claims to have nothing to share. So the travelers create a fire, hang a pot of water over it and place a stone inside, telling one and all that they are creating “stone soup.” Of course, it will taste better with a little something for flavoring, a carrot, a potato, maybe even a little piece of meat. Soon everyone in the village has contributed “just a little something” and everyone sits down to enjoy the wonderful feast. Innovation Nights are like stone soup. Someone has a space where we can hold an event, with tables and wireless. Other companies have new products to promote Others are social media mavens who can create buzz. Still others donate a few hours of their time and expertise. Soon, everyone is benefiting from the wonderful event we create together.